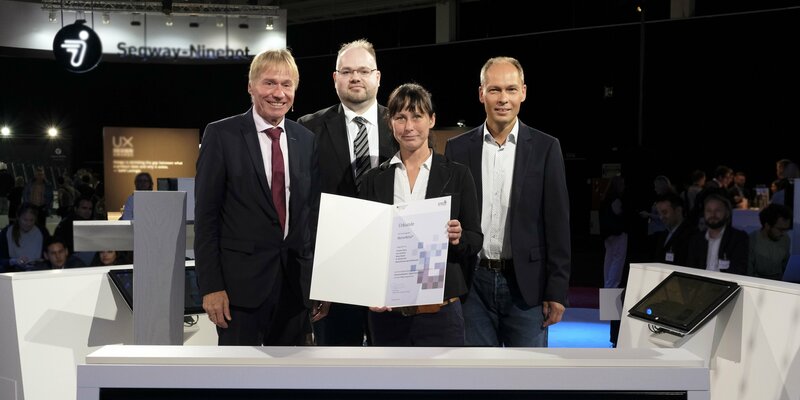 The MeineReha® team from the Fraunhofer Institute FOKUS had applied with its business idea for the “Gründerwettbewerb - Digitale Innovationen” of the Federal Ministry for Economic Affairs and Energy (BMWi). The award ceremony on August 31 was the highlight of the competition, in which a total of 323 teams took part in the first round in 2018. The competition ”Gründerwettbewerb - Digitale Innovationen” is addressed to start-ups with innovative business ideas based on ICT-based products and services. The jury of ten experts from industry, finance and science presented awards to 20 start-up teams at the International Consumer Electronics Fair (IFA) 2018 in Berlin. After the medical efficacy of the MeineReha® system had already been proven in May 2018, the business model for the innovative and technology-supported care offered by MeineReha® has now also been confirmed. In a two-stage selection process, the MeineReha® business model, as well as the associated range of services and price structure, were assessed and awarded as positive by industry experts. In the first round, the participating start-ups received an evaluation of their start-up idea and an analysis of the offer submitted. With MeineReha® Fraunhofer FOKUS has developed a complete system for telemedically assisted prevention, rehabilitation and aftercare. It makes it possible for medically valid therapy modules to be accompanied by appropriate specialists and for individual therapy and training units to be specifically integrated into the patient's everyday life. Therapy-relevant data (movement, vitality and other therapy-relevant data) are recorded and, if necessary, therapeutic interventions are offered. The training and therapy environment MeineReha® is designed to motivate people to sustainably perceive health-promoting activities, to help patients perform therapy exercises correctly after a stay in a hospital and to avoid chronic illnesses.